The next couple of months are full of joy, decorations, traditions, travel, friends, family and food. Which is what makes the holiday season so fabulous. And also so darn stressful sometimes. You want to be relaxed, enjoy the festivities and be present with those people who are most important to you. But, you also want to feel great. You want to look great. And, not watch the ball drop on January 1st wishing your jeans weren’t so snug. The holidays don’t have to be so stressful. This year, you can celebrate without compromising your palate or your progress. Not to boss you around and tell you “eat this, not that.” But, to be really truly understanding and supportive. That’s what the new November/December issue of Raw Food Magazine is all about. Decadent, scrumptious and simple raw food recipes to help you enjoy the flavors of the season without sacrificing your health or expanding your waistline. Real, honest conversations and advice on self-love and acceptance. So you aren’t stuck judging everything you put in your mouth over the next two months and you can enjoy the holidays without a regret-hangover at the end. Plus our top-rated Gift Guide for ideas on how to keep the healthy times rolling well into 2017. Life is not an either/or situation. It’s an and. It’s always been an and. You can enjoy food and stay slim and healthy. You can be present with friends and family and take care of yourself. You can choose raw food and indulge without your world crashing down around you. 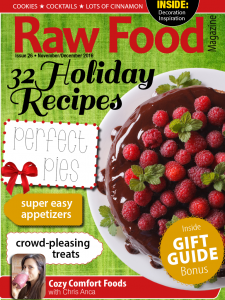 So, if that sounds like the kind of season you want to have, please join us and enjoy the new issue of Raw Food Magazine by clicking the green button. Yes. You can indulge this season without the downside. Click the green button to grab this new issue and see for yourself.